Jennifer Lopez makes an incredible number of awful movies, from titles like Gigli and Maid in Manhattan to The Back Up Plan and Monster-In-Law. That said, I for some reason will always find a way to forgive her simply because I like her performance in Steven Soderbergh's Out of Sight so much. Her chemistry with George Clooney and overall awesomeness is so off the charts in that film that I can't imagine it was just a fluke, and therefore just blame her for her inability to choose a decent script. 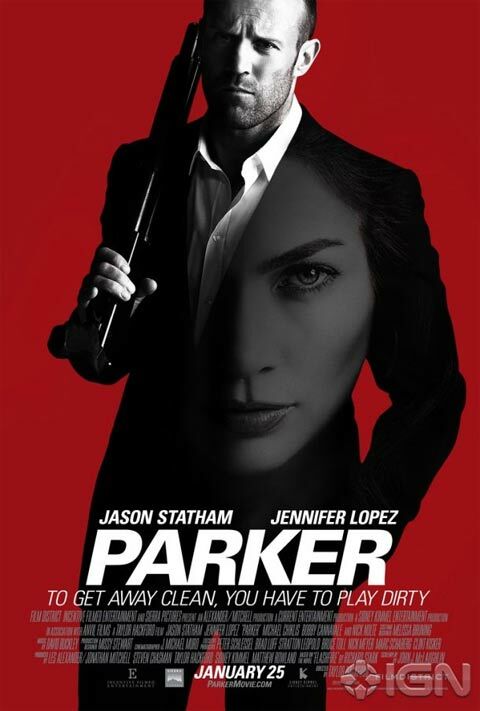 Perhaps Parker will be the movie that will allow her to show her potential once again. IGN has their hands on the first poster for the upcoming Taylor Hackford action movie, which is based on the books by Richard Stark (aka Donald E. Westlake). Check out the new artwork below and see it full size over at the source. Hackford's first film since 2010's Love Ranch, the film follows Parker (Statham), a thief who refuses to steal from people in need. The story begins he turns down the opportunity to be a part of a major jewel heist and barely survives. As revenge, he teams up with a female real estate agent (Lopez) to try and track down the treasure and steal it for themselves. The supporting cast includes actors like Michael Chiklis, Nick Nolte and Clifton Collins Jr. and the movie will be in theaters on January 25, 2013. With new posters often comes new trailers, so keep an eye out for that in the next couple of days and in the meantime you can read more about the movie in our Blend Film Database.